Item History: The Rockwell Collins Precision Lightweight Global Positioning System (GPS) Receiver (PLGR) is a self-contained, hand-held, five-channel, single frequency (L1 only) GPS receiver that provides accurate Position, Velocity and Timing (PVT) data to individual and integrated platform users. PLGR supports position location, target location, rendezvous and en-route and terminal navigation. It is powered by disposable batteries, is able to track five satellites simultaneously, features a four-line text display, weighs less than three pounds and can be connected to a wide variety of host platforms. PLGR provides real-time, precise position data for all combat elements to the battlefield information systems. 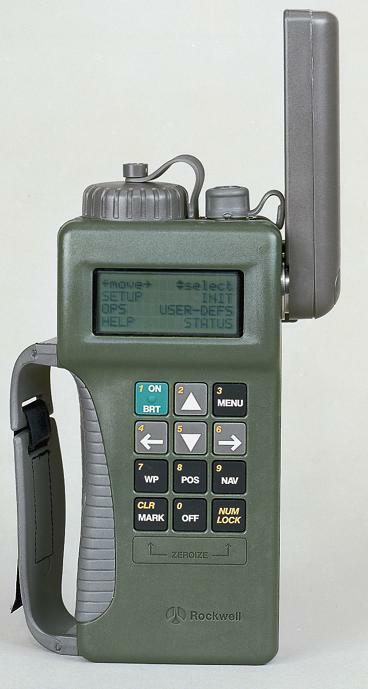 The PLGR was the most widely used GPS receiver in the military for 11 years. It was the first low-cost, small, hand-held GPS unit offered to the warfighter. The PLGR was initially used in the mid-1990’s by US armed services to plot their precise locations and offered more accurate targeting. It could be found in tracked and wheeled vehicles and as a replacement shipborne receiver on Army watercraft. A mount and external antenna were available to install the set in vehicles. When installed in a vehicle, power could be provided by the vehicle's power system. This capability greatly increased the knowledge of commanders on their soldiers' locations, enhancing the safety of the infantry units. The basic contract award for PLGR was in March 1993 and more than 200,000 units have been fielded worldwide. The original PLGR was supplanted in 1996 with an enhanced version featuring advanced operational capabilities, including improved computer memory and power consumptio characteristics. The PLGR is still offered and used in the battlefield today.